Members for full details of the walking programme please log on to the ‘Members’ page of the website or head directly to the programme here. Non-members If you have not walked with us before and would like to see if our club is for you, you are welcome to join us on a walk before you join. You can apply to join the DWRG for £5 per annum. See the ‘Join up’ section of the website. If you have any questions before you join, please contact Bev, our Membership Secretary, using this Membership Enquiry Form. On the form please ensure that you provide sufficient details to enable Bev to get back to you. 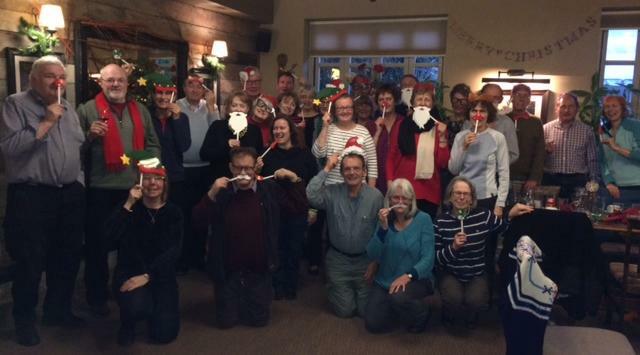 Recently a large group of DWRG members enjoyed an excellent Christmas lunch…. DWRG is an independent rambling and hill walking group aimed at people in their 40’s and upwards, but we have no age restrictions. We encourage others to enjoy walking and you can become a member of this club for just £5 per year which entitles you to come on any of our walks. We usually have a day walk every Sunday (typically with a pub lunch) and evening walks on summer Friday evenings (May to September). Our walks are mostly in the Surrey, Sussex and Kent area, although occasionally we venture further afield. Sunday Walks – full day walks, over distances of 8 to 12 miles. Some are “figures of eight”, making it easy to walk just the morning or the afternoon. We almost always stop for a pub lunch and a drink, or you can bring a picnic if you prefer to eat outside. Group size averages 8 to 15 people. Weekend / Bank Holiday Trips in the UK– for coastal, moorland and mountain walking, using a variety of accommodation. Friday Evening Walks from May to early September we go out for short evening walks to a country pub. Please take time to look around our site. It is being developed as a home for all our photos and discussions. If you are interested in joining, it only takes a few minutes to complete an online application. Our membership secretary has created a How to Join page for you. Please also check out the Frequently Asked Questions.